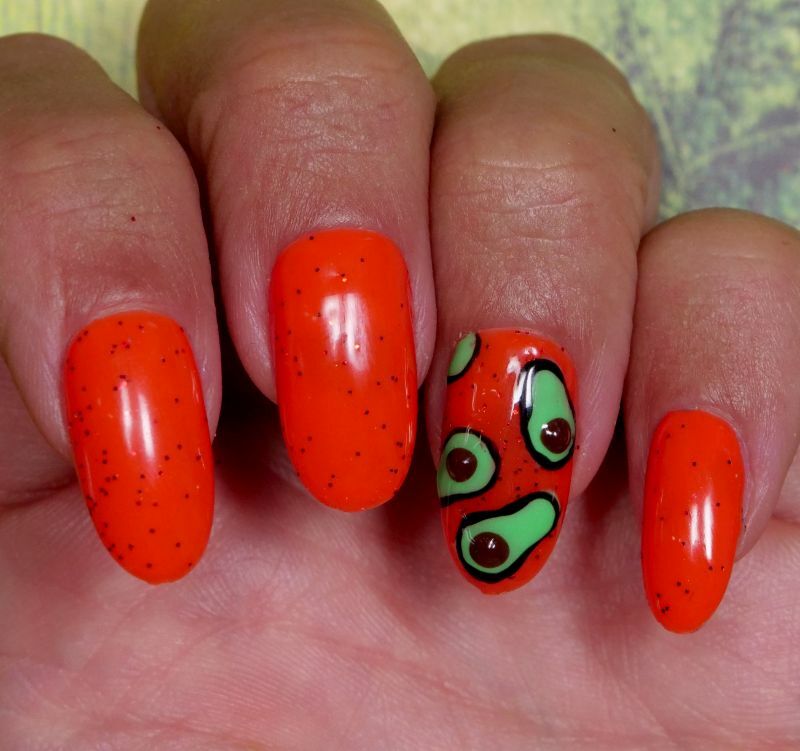 This playful nail art design will show the world that the humble avocado should be revered. The red backdrop sets the stage for a tribute to your favorite fruit. These little avocados have several advantages over the real thing. They won't turn brown, and they won't make you gain weight either. To create this design, start with a reddish orange base. Add a little glitter, and start drawing. The avocados start out as ovals, and then the base is widened slightly to create that characteristic shape. Build up the "pit" with multiple layers of polish, and finish the design by outlining the shape with black paint. 1. Apply two coats of reddish orange gel polish to the nails, curing them between coats with the UV or LED lamp. 2. Dip the fluffy brush into the copper nail glitter, and brush the glitter onto the nails. 3. Apply gel base coat polish to the nail, and cure the polish with the lamp. 4. Create light green nail paint by placing a small amount of green and white nail paint on the Post-it notepad with a clean toothpick, treating it like a small paint palette. 5. 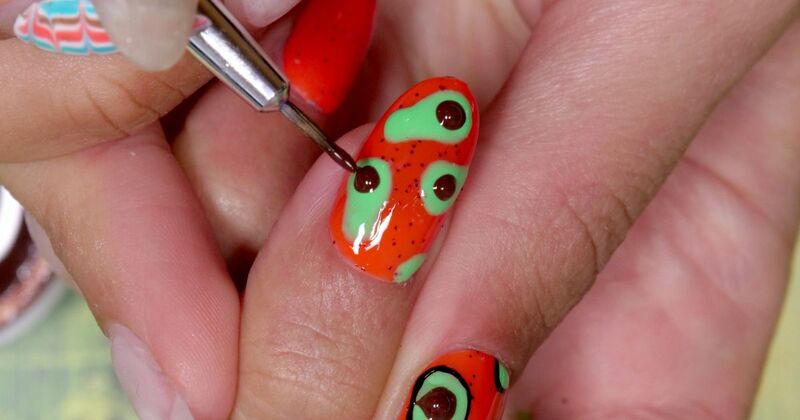 Mix the two colors together, and draw the avocado shape on the nail with a fine detail brush. Cure the wet paint with the lamp. 6. Dip the fine detail brush into the brown paint, and apply a circular dot on top of the avocado design to represent the pit. Place the brown paint in the widest part of the green design. Cure with the lamp, and repeat this step to build up the paint. 7. Outline the avocados with black gel paint using the fine detail brush. Cure the paint with the lamp. 8. Apply a layer of no-wipe gel top coat to seal in the design, and cure the paint with the lamp one final time.